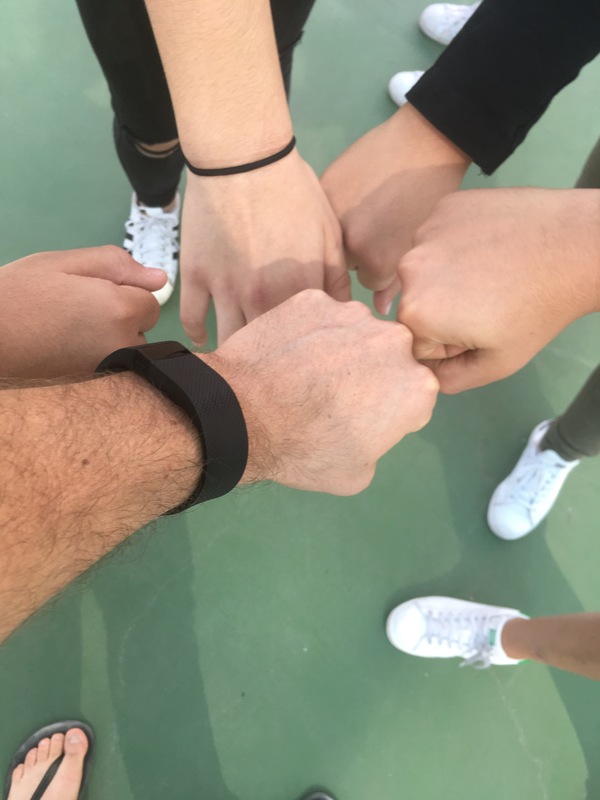 Last week, I spent the day going from class to class as an MYP student, experiencing a small taste of what our students experience on a day to day basis. I outlined my reasons for wanting to give being student a try earlier – most importantly to build community with our learners and show them that a school shouldn’t be about top down learning, but a group of people all working to learn together. Here is a gimps into what I experienced – if you are interested, check out the full story here! Many students love school, but many students find school to be an uncomfortable place to be. There are so many different types of learners – how can we meet them all at their level of interest/understanding? Student conversation that sometimes seems like silliness is often provoked by, or is connected to the learning. Our teachers are providing a wide range of experiences – hands on, analytical, creative, dialogue-driven etc. – in order to support our students’ growth. Having a nice lunch break to play sports is awesome. 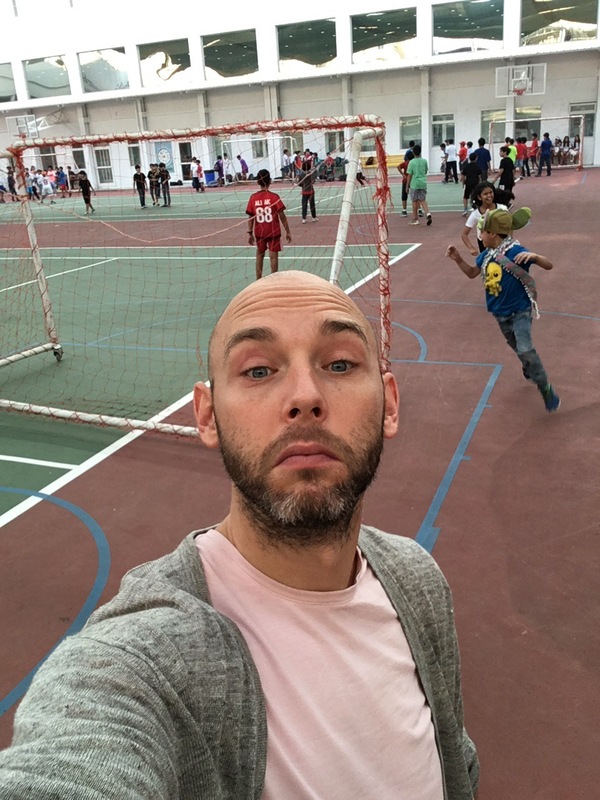 Experiencing students teach me Arabic and seamlessly switch between reading, writing and speaking two very different languages was honestly like watching a magic show – I was in awe. There is very little we can do in our classes that will ever be as important to our students as what is going on in their lives, right now. All the more reason to try, as much as possible, to connect the experience of learning to the lives of our students. Being a student is hard – you are expected to be “on” all day, completely focused on things you aren’t necessarily choosing to be focused on and expected to be proficient in things that you may not understand, or be interested in. We would rarely hold adults to these types of standards, why do we expect this of children? Students appreciate seeing their teachers as learners – the feedback I got from our students was outstanding. Simply put, our students are amazing – mad respect. I would highly recommend this experience to anyone who is interested in trying it – even if it is only for one class! I not only learned so much about our students, I learned a lot about myself as a learner. My next step? Take this experience and spread it out over a week’s time, with each entire day of the week devoted to one MYP year level. Hopefully I get the chance to do this before the year is out! What do you think of this experience? Would you try it? If you do, please let me know! I started my day hanging out on the soccer pitch with my MYP 1 classmates. I’m not much of a soccer player so the boys weren’t really interested in having me play…so I mostly just chatted to people who were hanging out. Many students were curious about why I would want to be a student for the day which gave me my first provoking thought of the experience – many students don’t enjoy the experience of going to school. School can be intimidating, scary, uncomfortable, yet we are obligated to attend. How can we as educators keep this in mind when we are working with our students? How can we honour the fact that, for many students, school is an uncomfortable place? My math experience was awesome! I had done the previous night’s homework and was prepared to discuss my solution to an open-ended problem. However, while in the midst of a great discussion about fractions, I noticed that the dialogue was only happening with about 20% of the class. About 50% of the class seemed disinterested, while the other 30% had either not completed the necessary work, or seemed to not understand the task. This was my next provoking thought – differentiation is hard, but vital. 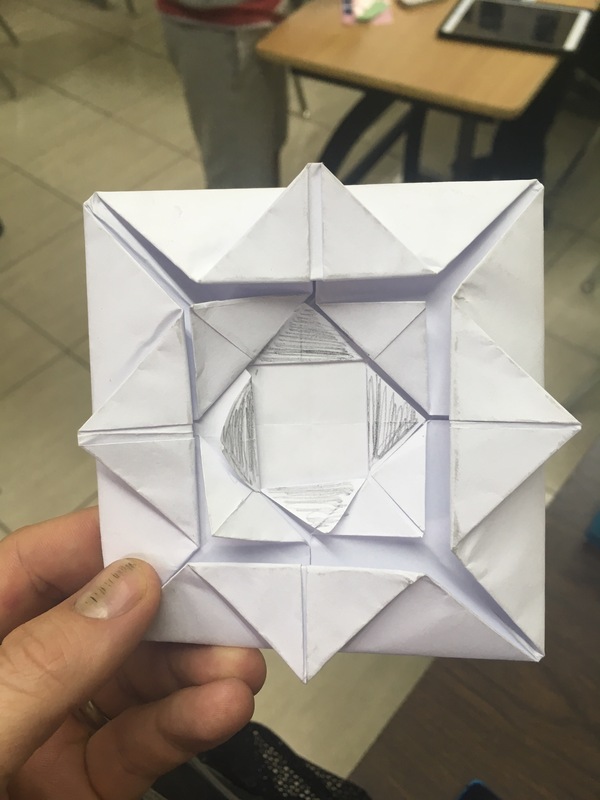 My math teacher did a great job of providing an interesting, open-ended problem and even had developed extensions to the problem for those with a thorough level of understanding. Even though only a few of us participated, the conversation was amazing – but how do we provide the same type of stimulating experience for those with a developing understanding? Or those who simply aren’t interested in conversations? I don’t have the answers to this, but I know it’s something that I’m going to emphasize in my own practice based on this experience. Visual art class was always my least favourite subject in school, which is precisely why I built it into my schedule. I found myself debating with my table mates about the drawings we analyzed, despite being instructed to work independently. 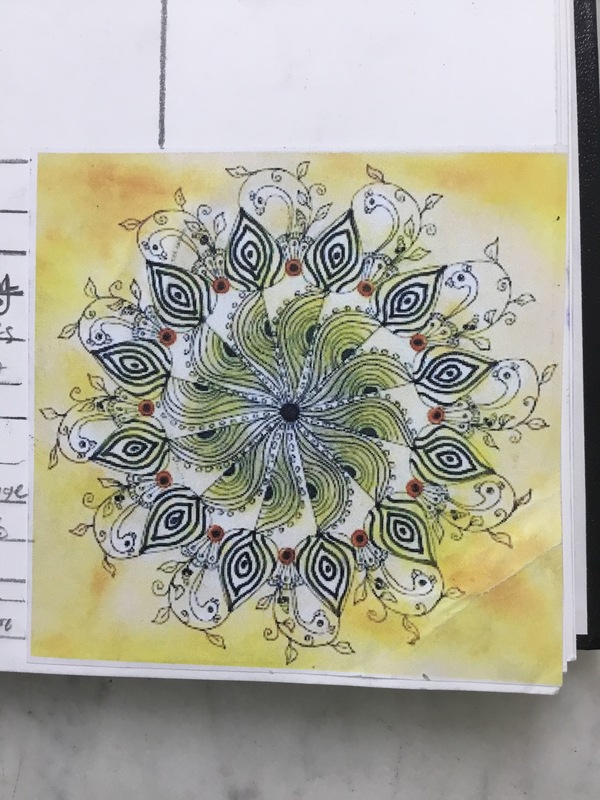 I said the drawing looked like a peacock, but my group disagreed, so I pulled out my device to Google images of peacocks to prove my point…again, against the rules. This provoked my thinking further about student behaviour. Yes, I was breaking the rules, but I was doing so in order to have quality debate with my classmates. How often do we perceive student talk or student tech use to be an act of defiance, when it is actually an act of learning? Summative time! My only summative assessment expereince of the day had me and my classmates creating a piece of social protest (I chose to create an infographic protesting traditional schooling), which I hope we get a chance to share in some forum or another. Students were highly engaged in the opportunity to share their voice; reaffirming that action is a crucial component in engaging learners. One sad takeaway was the number of students who were protesting the pressures they feel are placed upon them at school. Extreme pressure to perform in school is something very real for our students and something that, I must admit, I never really had placed on me as a child. Hearing my classmates’ experience with this type of pressure made me wonder – how do we strike a balance between having high standards for our students, while at the same time ensuring that we aren’t putting too much stress upon them? Played basketball the entire time – amazing. Mind blown! My two biggest takeaways from this experience were: 1) our students are amazing! The ability to speak and write, interchangeably in both English and Arabic – two languages that don’t share the same characters or even the same direction in which you write – is nothing short of amazing. 2) The small amount of Arabic I know after four years in Kuwait is sad. That being said, I was invited into a group where we wrote a skit about going to the dentist. I learned many new phrases and have even been invited back to perform for the class! We were working on a reserach project in I & S, so I was given independent time to continue my inquiry, which I did, but with an ear out for what our students were discussing as they inquired. The big topics of discussion? Plans for how groups of friends were going to meet up at the Under 14 Girls’ Soccer Championships and what everyone was doing afterwards. Unless the teacher passed by, virtually 100% of the conversation was dominated by whom was driving whom, whom was sitting with whom and where the victory party would be afterwards. This lead me to perhaps my biggest takeaway of the day – students have lives. They have hopes, fears, friends, family, relationships, developing identities and developing minds and bodies that all create their fair share of drama, confusion and excitement. Virtually nothing we can do as educators can come close to being as important to our students as their own unfolding lives – as it should be. We, as educators, are so passionate about our work that we can sometimes lose sight of the fact that our students are real human beings with real lives. Our students will probably never care about our classes as much as we do, so instead of emphasizing our class why not put the emphasis on caring for and about our students as human beings? I am very excited about tomorrow. Why? Because I’m spending the day as an MYP student! I will be live tweeting my experience all day via @bondclegg. I wanted to ensure I saw the full spectrum of the MYP years, while at the same time scaffolding myself as a learner (hence MYP 2 math, art and phase 2 Arabic!). This is something I’ve wanted to try for a long time and I’m very curious to see what I learn, what the students think about having me in the classroom and what my colleagues think. I have a confession – I struggle with statements of inquiry. Like many people working in the MYP, I have found the process of writing a statement of inquiry both frustrating and confusing. That has all changed. Our staff recently had the privilege of working with Ali Ezzaddine as he guided them through a Lynn Erickson workshop regarding teaching and learning through concepts. We had many epiphanies, frustrations, confusions and triumphs over the course of the workshop. One of my biggest “ah-ha!” moments came as teams were constructing their statements of inquiry. It became so clear to all of us in attendance that by crafting a purposeful statement of inquiry, you can really keep the concepts (along with the content and skills) alive throughout your unit. The process of creating statements of inquiry has really been a challenge for our MYP team, but this workshop clearly demonstrated the value of diligence and collaboration throughout this process. This initial phase of construction a statement of inquiry, what Lynn Erickson calls a “level one generalization” was a great entry point for many of our teachers. In a nutshell, take the Key/Related Concept for the unit you are planning, add a verb and then include the other Key or Related Concept that you did not use initially. For example, if you are teaching Language and Literature and your Key Concept is perspective and your Related Concept is theme, your initial statement could be something along the lines of, “Theme influences perspective”. Before expanding upon your statement of inquiry, you have to look at the connections that you want to make between the statement of inquiry and your subject’s content and objectives. Ask yourself, “Which curricular standards do I want to focus on in this unit?”, and, “Which of my objectives do I want to target in this unit?”. 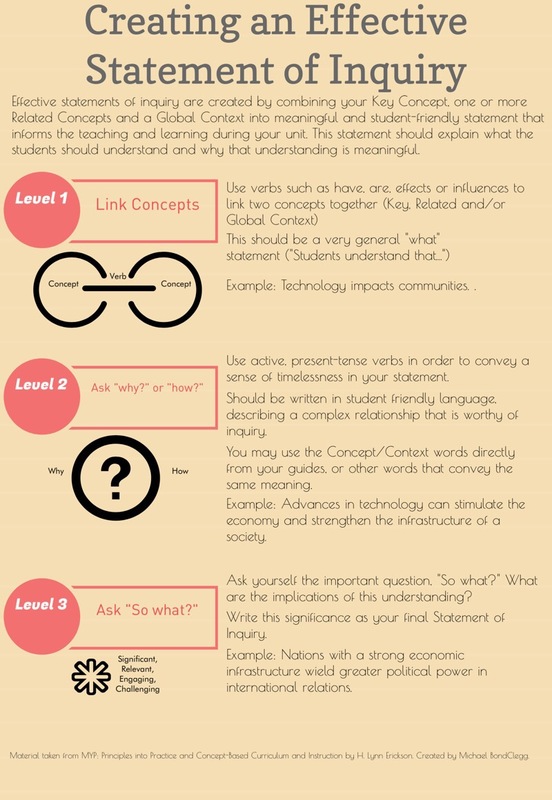 By focusing in on these two elements, you will be able to construct a statement of inquiry that allows the students to make meaningful connections between how they can utilize the subject’s objectives to connect the content of the unit to the concepts. The next step in constructing a purposeful statement of inquiry, is to take your initial concept-verb-concept statement and ask, “Why?” or “How?”. Then, using a resource like Lynn Erickson’s Scaffolding Verbs, you can create a richer statement. Our original statement – “Theme influences perspective” – could become, “Through the use of theme, authors can express perspective”. This statement of inquiry would probably target Language and Literature’s Objective A – Analysing. However, if we changed the statement of inquiry to, “Authors may use perspective in order to establish theme”, we might be targeting Objective C – Producing Text. This is where the deep thinking took place amongst the groups at our workshop. Great arguments conversations were had regarding the different directions the unit could take, all based upon the statement of inquiry! Many teams noticed that by investing the time to create a purposeful statement of inquiry (one connected to concepts, content and objectives), the summative assessment task, learning experiences and ATL skills for the unit all naturally fell into place. 4. The cherry on top – The “so what”? The final piece of the puzzle is asking yourselves, “So what?”, “Why would students care about this?”. It is this final step that allows you to marry your SOI with the Global Context for your unit and really situate the learning in life outside the walls of the classroom. This is where we can arrive at something like, “By expressing their culture through stories, an author can an audience understand their perspective.” Here we have use “stories” to stand-in for the related concept of theme; perspective is still explicitly stated, but we’ve brought in the Global Context of “Personal and Cultural Expression”, with a focus on sharing our cultural perspective with others. When the statement of inquiry becomes a foundational piece to help you construct your unit, the remainder of the planning process becomes much more focused and the learning much more purposeful. I had the amazing opportunity, through my University, to create a short documentary film regarding some of the oral literacy traditions present in the Arab world. I wanted this piece to reflect my learning in my course, but I also wanted it to be a tool that teachers at our school could use to get to know the culture of our students a little more intimately. I set about researching and booking appointments with “experts”, planning shot sequences and music – all the things I knew went into making a good documentary. Then I remembered the words of my favourite educational author and realized that I was missing the most crucial voice of them all. So I set aside the research and went straight to the source – our students. 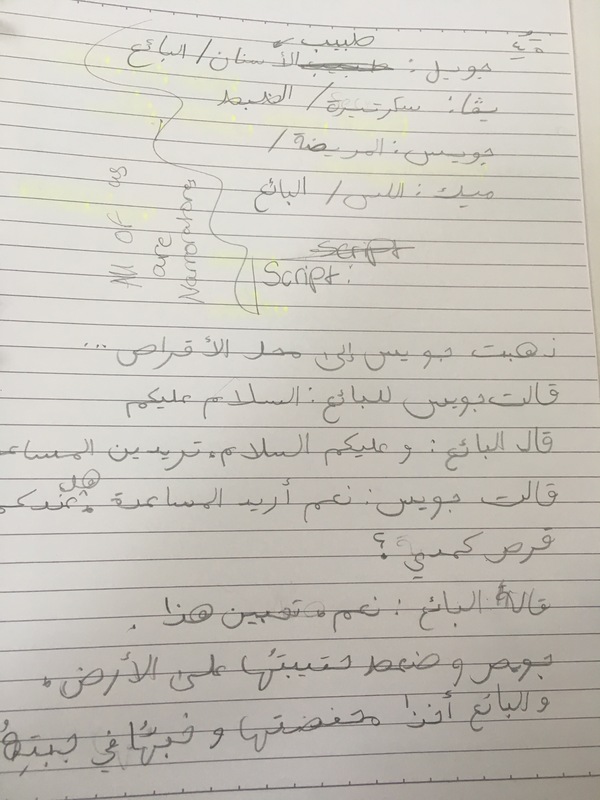 I wanted to know about their experiences as multi-literate human beings, about their experience negotiating the tensions that sometimes exist between Arab cultural norms and Western cultural norms and most importantly, to ask them the question, “What can we, as teachers, do to better reach you?”. The experience was profound (skip to 8:40 for the interesting parts). Our students were candid, insightful, honest and genuinally appreciative having been asked to share their experiences. This gave me pause to think – all of the times we are puzzling over how to effectively reach our classes, or a particular student, all the times we are trying to figure our students out – could the answer lay in asking the students themselves? Of course there is balance to be struck in terms of effective strategies we might be aware of that our students are not, but why not start with the learner? After all, don’t our students know themselves better than we ever possibly could? After our interview, I felt, as an international educator, embarrassed that I hadn’t taken this opportunity to get to know my students on this level at an earlier time. However, as I reflect, I am sincerely grateful for the opportunity to know our students better and hopefully I will be able to reach them in a way that makes them feel more comfortable and at home in their school community.